8.25 in. MALAGA Bowl. 3.75 in. base x 3 in. deep. MALAGA - Mould Shape - 3.5 in. deep. Malaga is name of Spanish wine. 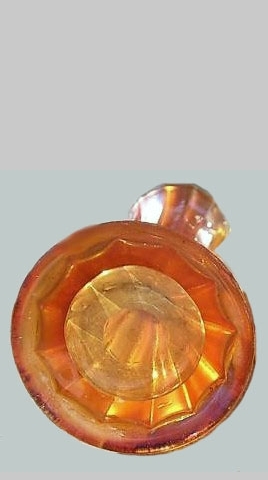 MALAGA : Design characteristics and the known colors tend to place this into Diamond Glass production from the mid to late 1920s. Shards were unearthed at the Indiana, PA plant site, leaving no doubt about its origin. 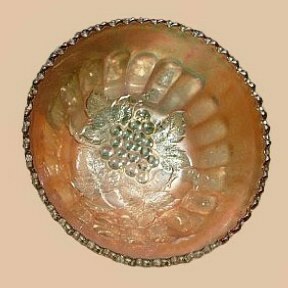 Malaga is an interior design found on rosebowls, 9” bowls and a chop plate of 10” in diameter. 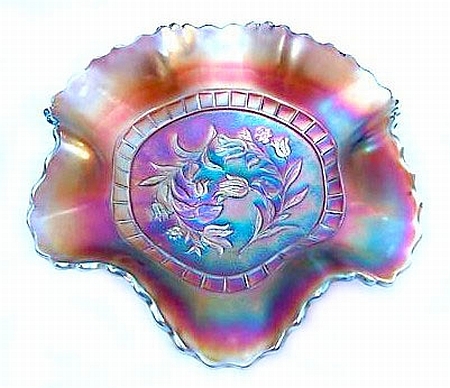 The plate is marigold; dominant color in the pattern, with only a couple of amethyst examples known in the bowl and rosebowl shape. Since so few examples have surfaced in the pattern, the possibility exists that it was in production at the time of the 1931 fire. WINDFLOWER 9 in. Bowl in Scarce Amethyst! WINDFLOWER Bowl: In amethyst will require some patience to acquire. Most of these bowls are ruffled, but an occasional ice cream shape can be found. Marigold Windflower bowls of the ruffled variety are actually quite available. Only known ADAMS RIB Juice Tumbler. 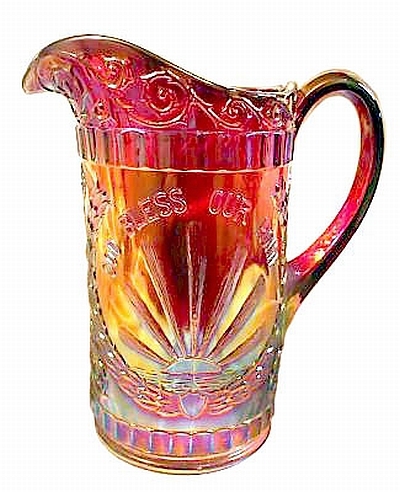 ADAM'S RIB Juice Tumbler: Rick Kojis, longtime collector/dealer of vintage carnival glass listed this item on eBay in early April, 2009, declaring it to be “unlisted”. It sold for nearly $394.69 on April 12, 2009! 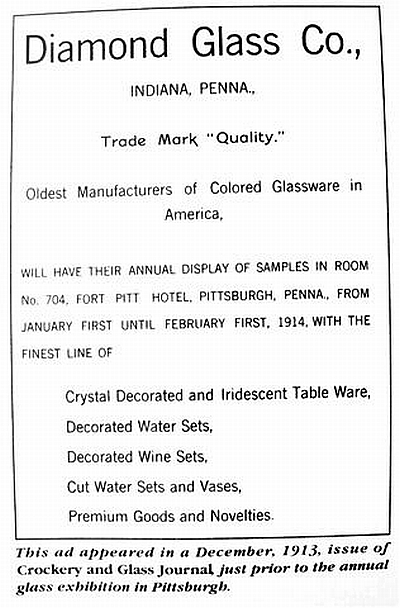 This pattern was marketed by Diamond Glass Co. in 1925, as their #900 series. Celeste blue shapes are known in a Lemonade pitcher, a 9 ¾” vase, compote, candlesticks (flared base), fan vase and a large pedestal footed console, prior to this additional “find”! Measurements of the tumbler: 2 3/16” top opening, 3 ½” tall, with a base diameter of 1 7/8”. MANY RIBS - or - GOLDEN FLUTE-that is the question!. 12 Panels in this MANY RIBS or GOLDEN FLUTE vase. 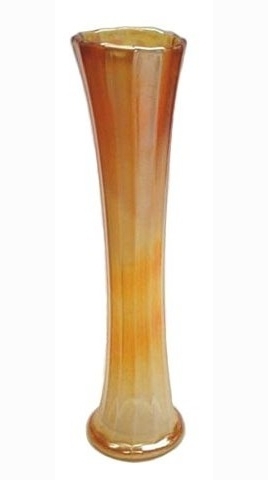 GOLDEN FLUTE Vase: Strong similarities exist between this vase and MANY RIBS produced by Dugan. 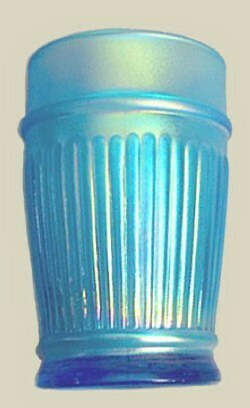 The 1981 booklet published by Angela Hallam named the vase Golden Flute. Some of the statements found in that publication have proven to be somewhat controversial, so we shall present the facts as we know them, and our viewers can make their own determination. The vase shown here is 9 ½” tall. Examples are really quite scarce and seen only in marigold. There are four mould seams and they are usually 9”-11” in height. The base is smooth and from 2 ¼”-2 ½” in diameter. 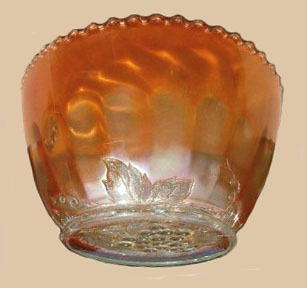 Since Many Ribs, as a Dugan design was ruffled, crimped or JIP shape, and sometimes a hat shape, limiting the height to 5”-7”, it is difficult to say that it is the same mould Diamond used after 1913, perhaps limiting production to marigold examples? Vintage sets made by Diamond. GOD & HOME Reproduction: L.G. Wright purchased many of the Dugan/Diamond molds after 1931. Very nicely done, this pattern was initially produced in amethyst only. When the red and ice green sets were made later, there was still no problem distinguishing them from the original old sets produced in cobalt blue. Those blue sets remain rare to this day! Here's the shocker! In 1982, Wright created a limited edition of 1,000 sets in cobalt blue carnival!! They were all trademarked, but we know that marks can be and are removed. So, be advised! Purple PONY 8.5 in. 10 Ruffle. 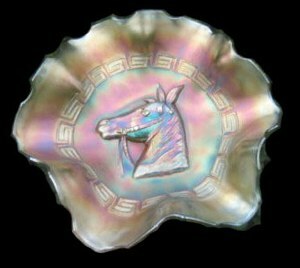 Rare PONY Bowl in Aqua. PONY in Aqua - Six Ruffle. 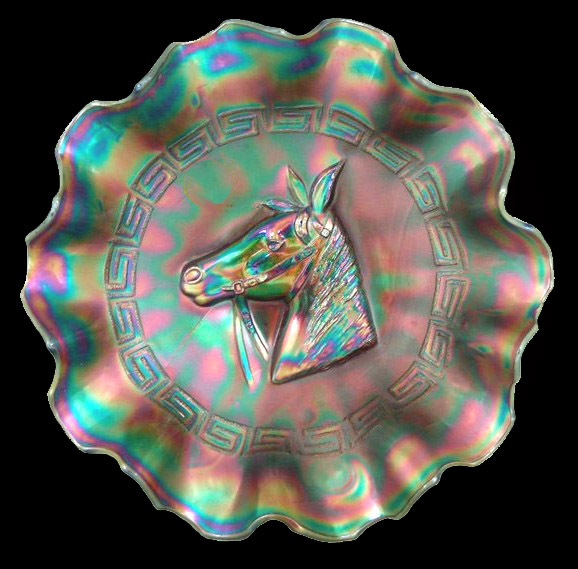 PONY Bowl: These bowls may have six, eight or ten ruffles. Marigold is the dominant color, but lavender, a couple of aqua with marigold overlay, and some highly prized ice green examples having a stretch-like effect in the iridescence place production with Diamond Glass Company. 1921 and following is the likely period of production. Amethyst (purple) examples are difficult to find. Ice cream shaped bowls are known in marigold, amethyst and ice green, with 9” plates confirmed in marigold and amethyst. You may view an ice green bowl by going to our Diamond - Part 3 segment. L.G. 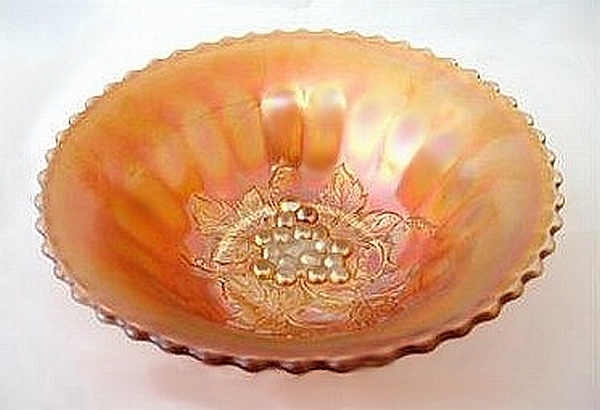 Wright reproduced both the plate and the ruffled bowl in the early `80s. They can be found in marigold and amethyst. A mirror-like finish was applied to the amethyst examples, so they are easily distinguished from older pieces having a more satin finish. The marigold examples are quite nicely done! Be watchful in making selections! 1 of 2 or 3 known UNLETTERED BROOKLYN BRIDGE. UNLETTERED BROOKLYN BRIDGE bowl: A large number of Brooklyn Bridge bowls were found in a storage room after the 1931 fire destroyed a large portion of the plant. Supposedly, these six, eight and ten ruffle bowls were distributed to local townspeople following the fire clean-up. The majority of the bowls are lettered “Brooklyn Bridge”. However, there are two or three very rare examples which lack the lettering. By 1930-1931, motorized airship travel was in full swing. Regularly scheduled flights between the United States and Europe had replaced ocean liners. Very likely these bowls were produced at that time in preparation for the 50th anniversary of the Brooklyn Bridge in 1932. This would explain the storehouse of them found following the 1931 fire. Additionally, a few examples in pink with marigold overlay are known. The Diamond After Glow line of pastel pink and green glass was introduced around 1928. Several well-known Diamond patterns, both iridized and non-iridized forms appear in After Glow. 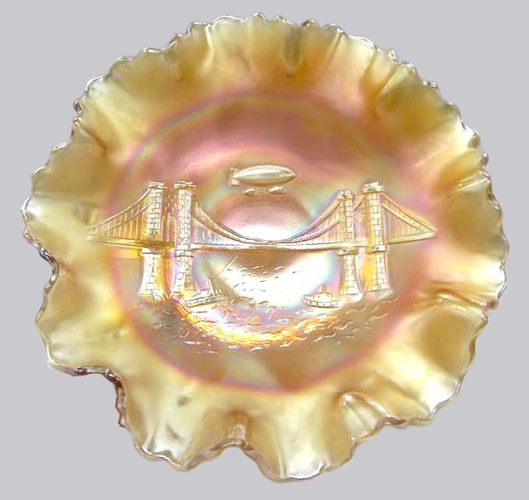 Iridized pink Brooklyn Bridge bowls must date following that time, more or less confirming that Brooklyn Bridge bowls were in production at about the time of the 1931 fire. During our years of following carnival glass, we had never been in attendance when one of these unlettered bowls was sold. In March 2009, the lovely example displayed here sold during a Wroda sale in Greenville, OH. Resulting price: $2,300. Previous estimates placed $2000. as an expected sale price, so perhaps a new record was established.